Part 8 – This is Part 8 of our free 30-day Email Marketing Training Series. And, the short answer is you should test your list to find the best time for your customers. Play around with different days or times to see what works best for your business. Each business is different and has a different audience, so you should figure out the lifestyle of your audience and when they would be likely to open and read an email. Also, if you have broken down your contact list into segments—by city, by hobby, by other demographics, etc.—then you may want to schedule email campaigns to run at different times depending on the list you are sending to. For example, you may want to schedule an email blast to run at 2:00pm EST for all your contacts in New York, but then you may want to schedule another email campaign at 2:00pm CST for your contacts in Texas. If you scheduled the entire blast to run at 2:00pm (your time), then the emails would be running at your 2:00pm timeframe across the board, no matter where they live. That being said, there have been numerous studies on when the best times to send an email are, and I’ve listed the interesting facts below. Use this list to start testing your email list to find out if the same holds true for your business. In a study run by GetResponse, people send over 17% of all emails on a Tuesday, making it the most popular day of the week to send. Also, Tuesday’s emails have an overall open rate of about 18%, the highest open rate compared to other weekdays. Tuesdays are also a good day to share updates, send out a blog post, or educate your readers. 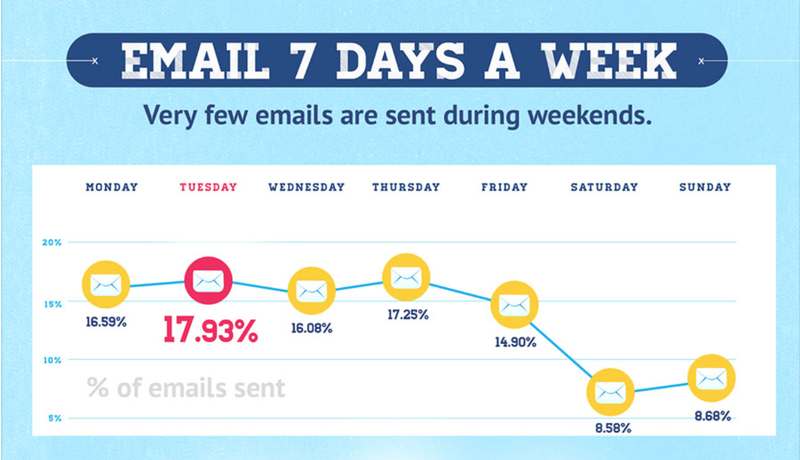 I’ve also learned from Digital Marketer that Wednesdays are great for sending content emails. If you need help driving clicks or want your readers to perform an action like signing up for a webinar or buying a product, then you should focus that effort on sending later in the week. The highest click-through rates have been found to be on Fridays. Studies have found that the highest email open rates are in the afternoon and evening. Most people don’t want to start their day with your emails. They are trying to start their day on a productive note and your email may get pushed aside due to more pressing work-related issues. Experian gathered data from a client-wide survey to determine the best time of day to send emails. They found that while the majority of emails are sent between 8:00 AM and 12:00 PM, the highest engagement rates occur between 8:00 PM and 12:00 AM. And, my general answer is to send as often as you feel comfortable with. 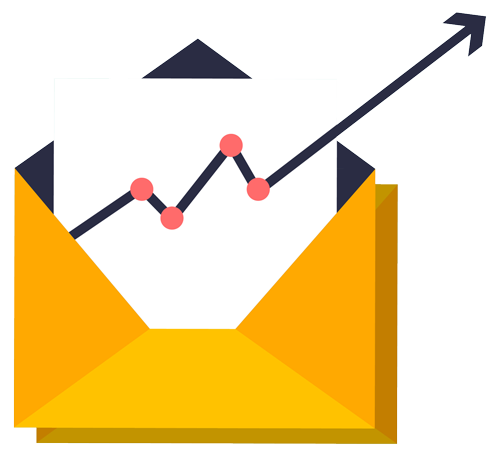 If you notice a spike in unsubscribes, then that is usually an indicator that your audience thinks you are sending too many emails. However, I suggest to only send as often as you have fresh, relevant content to share. If you can create a weekly campaign that is engaging every single week and is not the same thing, then go for it! If you have a small business and you only use your email list to send newsletters, then you can start by sending once a month. Or, if you blog regularly, you may want to send once a week or once every 2 weeks to deliver your new blog content and drive traffic. You can also set up your emails to be delivered immediately upon posting of a new blog post. Send AT LEAST once a month. Otherwise, email providers like Google, Yahoo!, AOL, etc. will think you are spam if you only deliver once a quarter. These services will recognize an email if it has been sent within 30 days, so if you only send once in a blue moon, then these services won’t recognize you and you will get classified as SPAM. Only Send Content When You HAVE Content. If you don’t have any useful, fresh or engaging content to share, then don’t send just to send. Make sure your emails are relevant and productive. No one wants to read the same email over and over again. Try re-creating your content or present your products or services in a fresh way with each email you send. Consider Your Contact List. At what stage in the relationship cycle is your email recipient? Are they already a customer or are they a potential customer?Determine the goal of your email—to sell, to generate leads, or to create awareness—and then consider the email from your subscriber’s point of view. Who are the people on your list and how often do you think they would need (or want) to hear from you?And from there, you can determine how often you should communicate with them. The best way to prevent mediocre email campaigns—and to not want to pull your hair out in the process—is to plan out your email marketing strategy. Like anything, a well thought-out plan will set you up for success. You need to be strategic in your email communications, so in order to do this, you should plan it in advance. In order to help you create your email marketing strategy, I’ve created an email marketing plan template for you to download and use as your own strategy builder. In this plan, there are 2 tabs. Tab 1 is the full-year email plan scheduler and tab 2 is an email planner for an automated series—aka autoresponder sequence. You do not have to create a 30-email automated campaign, but you can use this to plan out your automated series. Use this to help you develop new email ideas, to track your results and to build out an email strategy over time. And, that’s a wrap for part 8 in our Email Marketing Training Series. Do you have any questions? If so, comment below and I’ll get back to you as quickly as possible.